Item Type: Toilet Brush Set. 1 x Toilet Brush. 1 x Toilet Brush Holder. Thick brush head ensures more thorough cleaning effect. Adopts cute cherry shape design. Compact and lightweight, convenient to carry. ❤ Exquisite Outlook - Stylish plating and removable design make this toilet brush looks more exquisite. It has very intensive and soft hair. Free punch no trace glue, will not hurt the wall. ❤ Easy Installation - It’s easy to paste and no need to punch. Category: Crevice Brush. Scope: windows cracks, keyboard and so on. Colour: Black. Material: plastic. We believe that everything could be solved by communication. MPNDoes Not Apply. UPCDoes not apply. Specification: With detergent. it usually takes about 2 to 4 week. Weight: 60 g.
Trending at C $23.39eBay determines this price through a machine-learned model of the product's sale prices within the last 90 days. This toilet brush handle is made of stainless steel and its head is plastic, which is tough and durable. It is very easy to clean and the effect of cleaning is visible. Ideal for bathroom cleaning. Are you often troubled by the dirty water and stains that hit you when you clean the toilet?. 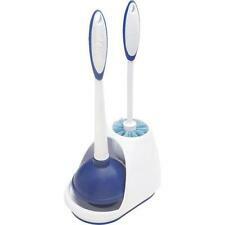 Or do you want to make the toilet brush easily accessible and avoid feeling sick because of the dirt on the brush?. Toilet brush set design for convenient, clean and sanitary. 1pcs x Toilet brush. Brush head is black and Brush head can be replaced. colour: Red. Moderate hardness brush, rugged stainless steel handle. Material: 201 stainless steel plastic brush. Black brush design, stainless steel handle, stylish simplicity. 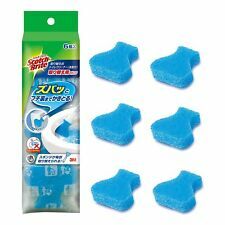 Type:Cleaning detergent stick wash brush. ITEM:Clean brush. Usage:Household Cleaning. Type:Cleaning Brushes. Usage:Household cleaning. Handle material:Plastic. Color:Random color. Modern Design Stainless Steel Toilet Brush. 1 x Toilet brush with holder. Modern design matches any bathroom decoration. Removable brush head and built-in plastic basket for easy cleaning. Holder height: 11cm/4.33". The brush is with powerful detergency, antibacterial and deodorant. Made of premium material, the toilet brush is durable and long lasting use. The extended and thickened handle design makes it more convenient to use. 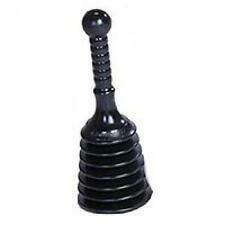 1 X toilet brush holder set. Wall Mounted. Material Stainless steel ABS. We'll do our best to help you solve the problems you may have. We will work with you to until you are satisfied. We do not know how much they will be. Features:Durable and practicalEasy to installVery convenient to useWall mounted design,save placePackage includes fixtures and fittingCan help you more effectively to achieve the best cleaning effectSpecification:Material:Chrome & Frosted GlassColor:Silver&ClearLength of Brush:34cm/13.38"Length of Brush Handle:24.5cm/9.64"Diameter of Brush Handle:1.5cm/0.59"Height of Holder:11.5cm/4.52"(Top),8cm/3.14"(Bottom)Diameter of Holder:11cm/4.33"Package include:1 x Chrome Wall Mounted Toilet Brush1 x Toilet Brush Holder1 x One set of Screws(As Pictures )Note:Light shooting and different displays may cause the color of the item in the picture a little different from the real thing. The measurement allowed error is /- 1-3 cm. Brand Unbrande. 【Clean helper】. 【Effective brush】. 【Easy to use】. A smooth and good grip handle is equipped for this brush, which is easy and quick to clean stool and bathroom, no fatigue hand and finish cleaning in minutes. Toilet brushes and the caddies that function as their holders make it easy to clean residue and stains from the bathroom toilet bowl. The black or white brushes for toilets are made by multiple companies, with brands including Rubbermaid home, Rubbermaid Commercial, OXO, Clorox, and others. 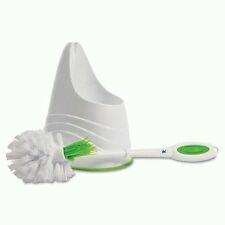 The toilet bowl brush and its handle reduce the amount of manual work it takes to get a toilet clean. What is a toilet brush and holder made from? Plastic: Most toilet bowl brush items have a long handle that is made of polypropylene or other plastics. The bristles of the brush are also usually made of plastic. Some of the holders for toilet brushes are made of plastic as well. Nylon: A toilet brush may have nylon bristles. 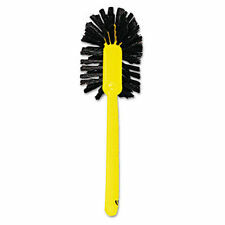 The nylon brush head offers enhanced flexibility for cleaning under the rim of the commode. Stainless steel: Stainless steel is a material sometimes used for the toilet brush holder. Stainless steel offers a durable housing for the toilet bowl brush when it is not in use for cleaning the bathroom. What are the features of toilet brushes and holders? Curved head: A brush for a toilet may have a curved head. This brush shape allows for easier cleaning under the commode seat and in the area of the toilet basin that leads to the bathroom plumbing. The brushes are usually white, and the holders may be white, black, or chrome. Aeration holes: Toilet brush caddies often have aeration holes. This allows the moisture to evaporate from the brush so that no mildew grows on it or in the bathroom caddy. The toilet brush itself may have aeration holes on the brush's head and on the plastic handle. Corrosion resistance: Most bathrooms have a high level of humidity, especially if the bathroom also has a shower or bathtub. A toilet brush holder resists corrosion, so the chemicals for cleaning the bowl do not eat away at the plastic or brushed chrome of the toilet bowl brush or its holder. How do you clean a toilet brush and brush holder? Although a white or black toilet brush is itself used for cleaning, the nature of what it does can leave a lot of smells and residue on the brush, its bristles, and the handle. 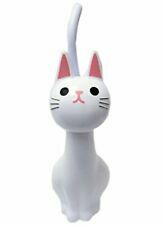 The toilet brush holder may also become dirty. It is important to regularly sanitize the toilet bowl brush, handle, and the holder item to prevent bacterial and mildew growth and to stop odors from developing in the bathroom. If the brush is unsanitary, the commode will be, too. To clean the brush and brush holder, fill a five-gallon bucket 3/4 full of hot water. Add 1/2 cup of bleach. Put the toilet bowl brush and the brush holder into the bucket. Submerge the toilet brush and holder in the water. Allow them to soak for one to two hours. Remove the brush and holder. Dry the toilet brush, handle, and holder with a clean white cotton cloth.